Ocean Eng. to Merge Into Course II in Jan. The Executive Committee of the Corporation voted unanimously to approve the merger of the Department of Ocean Engineering into the Department of Mechanical Engineering, effective January 1, 2005, wrote President Charles M. Vest in an e-mail. Faculty, however, had expressed both worries about the loss of a strong ocean engineering identity and hopes for a proposed interdepartmental Center for Ocean Science and Technology at a special faculty meeting Monday. The merger was recommended in August by Dean of the School of Engineering Thomas L. Magnanti, with an ensuing procedural study of the merger being completed last week by a committee chaired by Professor Steven R. Tannenbaum ’58. Vest had said that as he felt it “would be inappropriate to continue” the discussion of the merger beyond his presidency, and had said he would make the decision this week before incoming President Susan Hockfield takes office on Monday. Henrik Schmidt, acting department head of Ocean Engineering said that faculty were “disappointed by [the] turn of events” that led to Magnanti’s recommendation for a merger. “While the final merger provisions are now acceptable to the Ocean Engineering faculty,” provisions from the Aug. 19 recommendation were unacceptable and “would lead to the end of ocean engineering by a loss of identity, Schmidt said. Professor of Ocean Engineering Arthur B. Baggeroer ScD ’68 pointed out that in 1994, there were 22 faculty, while at present there are only 14 with four in administration positions. “The fragility happened over a long time,” was commented on by many visiting committees, ultimately leading to a “serious crisis” two years ago, he said. It is “incumbent on future administrators... not to let that happen” again with a fragile department, Baggeroer said. Professor of Archaeology Heather N. Lechtman, said that given current issues such as global warming, “we need the strongest OE department this globe has ever seen... I don’t think this addresses that at all, ” she said. Given a report by the National Research Council two years ago emphasizing the importance of education regarding the oceans, “this action over the long-run is going to diminish the role” of ocean technology at MIT, and “this is the wrong time to do it,” said Professor of Ocean Engineering Jerome H. Milgram ’61. Wierzbicki also wondered why Ocean Engineering would need to be integrated into one of the three existing sections of Mechanical Engineering, rather than being its own division. Wierzbicki said he worries that ocean engineering will “lose coherence and identity” if separated. “In the current provisions, this is a liquidation, and it’s far from the meaning of merger or even acquisition,” he said. Professor of Ocean Engineering John J. Leonard said that he was “disappointed with the Tannenbaum committee’s decision to merely list criticisms,” rather than pass judgment. “I do not feel that the organization of the Institute should be decided by faculty vote,” he said. Students in the department expressed concern both about the merger itself and their lack of involvement in the process. As Magnanti noted, “students could have been more actively engaged” in the process, and communication with students should have been followed more closely. Anna P.M. Michel G, president of 13SEAs, the Ocean Engineering student organization, said she felt the information provided by the department was poor. She said that no opportunity for feedback existed until the Tannenbaum committee solicited student input regarding the procedure. “Nobody was explicitly in charge of [getting feedback], so it didn’t really happen,” he said, adding that this needs to be fixed for the future. Brundage also expressed concern about the future of the department. She said that at this year’s Choice of Major Fair, members of the class of 2008 “thought [Course 13] didn’t exist” because of all the talk about a merger. Michel also said that she anticipates that following a merger, the graduate students in Ocean Engineering would come from a less diverse set of backgrounds, as they would be applying through Mechanical Engineering. Professor Paola M. Rizzoli said that Provost Brown began talks about a Center for Ocean Science and Technology two months ago that would be a collaborative effort between Courses 1, 2, 12, and 13. She said that in the past two weeks, a group has been formed to write the principles for the Center. Schmidt said the Center would have the “potential for increased national and international visibility” for Ocean Engineering. Dean for Undergraduate Research and Professor in the Ocean Engineering Department J. Kim Vandiver agreed that it would be a “great improvement if we were able to achieve an interdepartmental center or program,” but added that in previous efforts, cooperation has not been good between the departments that would be involved. “I doubt that there’s a perfect process for deliberations as complex as this merger,” Magnanti said. 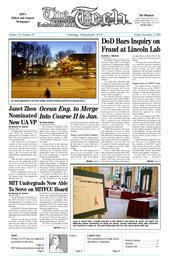 Tannenbaum chaired the committee, appointed around Sept. 1, which came about through Section 1.4 of MIT Policies and Procedures, which requires that “changes are carried out in consultation with the Faculty,” and that, in the event of a proposal to abolish a department, extent of prior consultation and adequacy of planning for affected parties. This section came about from the Widnall report issued May 13, 1988, after the abrupt dissolution of the program in Applied Biological Sciences. Tannenbaum said the procedure followed was to review all documents related to the merger, including the reports of all merger committees, send letters and e-mail to faculty, students, and staff in both departments, publish an announcement in TechTalk requesting feedback, and hold meetings with faculty, administrators, and students between Sept. 1 and Nov. 20. The committee evaluated only those events which took place prior to the Dean’s recommendation on Aug. 19, so as to avoid evaluating any of its own actions. “The process was too drawn out,” Tannenbaum said. Tannenbaum added that it was hard to separate complaints related to the process with those related to the merger as the two were intertwined. Magnanti said that the merger was the result of not only low undergraduate enrollment, but also fragility and lack of direction within the department. At present, he said, there are 16 faculty members within Course 13, two of whom are naval officers, and four of whom hold significant administrative positions, leaving only ten tenure-track faculty in research and teaching. In addition, he said, the department lacks a critical mass of faculty in certain key areas, leading to concerns about the future of the department. The merger would not be “a cost-saving measure” or “for recouping space,” Magnanti said. He said that although as a result of the merger, “we will realize some administrative savings,” these savings would then go toward the merged department. Magnanti also said that the merger does not signal similar action for other small departments: “clearly MIT has a place for small departments,” he said, and currently, no other organizational changes planned. Magnanti said that the merger has the potential to “create a more vibrant ocean engineering community” within the competing needs and resources of the MIT community. He said the merger would lead to a “larger critical mass of faculty in certain” key areas and he anticipates an undergraduate track in Mechanical Engineering replacing the Course 13 program would draw more students. Magnanti recommended the merger to President Vest and Provost Brown on Aug. 19, providing provisions on Aug. 31, he said. Among these provisions were new junior track faculty positions in ocean engineering, graduate programs with named degrees in 13A and 13W, the option for students in Course 13 to complete their degrees or transfer to the merged department, an extra seat on the Engineering Council for the merged department for at least two years, retention of the present space occupied by ocean engineering at the time of the merger, a tenure process for faculty in the department based on merit, not size, and a committee to be formed by the provost in five years to report to the faculty on the merger. The head of the Mechanical Engineering Department, Professor Rohan Abeyaratne, added extra provisions over the next five years, including an additional provisional head in the department, two seats on the Mechanical Engineering council for ocean engineering faculty, and additional funding from the Magnanti’s office for ocean engineering laboratories. The original committee formed to examine the merger, the Ocean Engineering Review Committee, was convened in Sept. 2002 to assess the department and examine the “merits of making Ocean Engineering a sub-unit of another department,” said Magnanti. The committee interviewed approximately 135 students, faculty, and alumni, and expressed concern about the small undergraduate and faculty size, leading to an inefficient use of faculty and resources. The committee also found that the department lacked a long-term vision and plan, Magnanti said. The committee made several possible recommendations, the two primary of which were: to appoint a committee to explore a merger with another department or to keep Ocean Engineering as a stand-alone department, but integrate the undergraduate program with another department, Magnanti said. Magnanti chose to explore the first alternative, appointing the second committee in Aug. 2003 to determine “which merger [would] best serve the interests of the institute,” he said. This second committee found “no insurmountable educational or research obstacles” for merging Ocean Engineering with Aeronautics and Astronautics or Mechanical Engineering, said Magnanti. Mechanical Engineering was chosen with condition to pursue the merger, and both departments voted to pursue the merger with certain set of conditions (though each department’s set was different), Magnanti said. A third committee was then formed “to define a collective set of expectations” and structure, Magnanti said. The committee suggested a number of recommendations, including continued support of the 13A and 13W programs, and a new 2A degree with speciality in ocean engineering. This new SB would include five ocean engineering classes, compared with ten in the current Course 13 degree. The number of graduate programs would also be under consideration for a reduction from eight to four. The merger would also commit to faculty renewal in ocean engineering, maintaining the current size for ten years, Magnanti said.